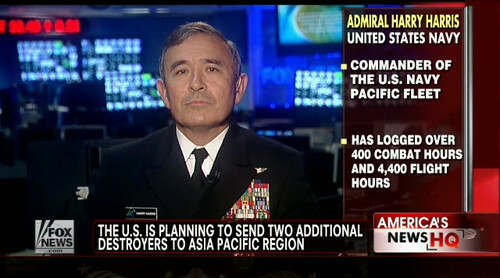 Adm. Harry B. Harris, Jr., appearing on Fox News, May 10 from New York. Adm. Harry B. Harris, Jr., commander of U.S. Pacific Fleet, was a guest on Fox News' America's News HQ program May 10, where he discussed the latest threats in the Asia-Pacific region and addressed America's rebalance, and the Navy's role in the whole-of-government effort. UMA PEMMARAJU: North Korea is showing no signs of bowing to international pressure to abandon its nuclear weapons program, today issuing its latest nuclear threat saying its official news agency - it would take measures, including a nuclear test to protect its sovereignty. The threat comes two days after South Korea’s defense minister says Pyongyang is making final preparations to conduct its fourth nuclear test. The last one took place back in 2013. As North Korea prepares to conduct its fourth nuclear test, the U.S. is pushing ahead with plans to send two additional ships to the area. It’s part of a larger effort to protect U.S. and Japanese interests as tensions with North Korea continue to rise. Joining us now the commander of the Pacific Fleet Admiral Harry Harris. Welcome admiral, great to have you here today. Thank you so much for joining us. ADM. HARRY HARRIS: Ms. Pemmaraju, it’s great to be here with you, thank you very much. UMA PEMMARAJU: Talk for a moment about the importance of what’s happening right now and that we are sending more ships to that region. ADM. HARRY HARRIS: Well we are as part of America’s rebalance to the Pacific. I’m the commander of the U.S. Pacific Fleet and by the end of this decade we’ll have about 60 percent of your navy – will be based somewhere in the Pacific. UMA PEMMARAJU: So the importance of this, of course being fueled by what Pyongyang has been doing -but this is something that has been in the works for some time though, correct? ADM. HARRY HARRIS: That is correct. The rebalance is part of our nation’s strategy for the Pacific. It’s part of a diplomatic, economic, political and military rebalance if you will, and my responsibility is the Navy component of the military rebalance to the Pacific. It’s more than just North Korea. It’s because of our nation’s interests in the Pacific and how important the Pacific is to the United States, which is a Pacific nation as well. UMA PEMMARAJU: Over the years we have seen the importance of that region, particularly at a time when there are tensions beyond North Korea. There are concerns between Japan and its relationship with China and North Korea over the waters there about sovereignty. I know the United States is trying to take a little wait and see attitude, but certainly, this is something that you’re keeping close watch on. ADM. HARRY HARRIS: Of course, we are. I’m in contact with my headquarters even now. We view the actions, if you will, by the Chinese as the State Department said yesterday in the South China Sea near the Paracel Islands, we view that with concern. We view those actions as provocative and it increases tensions in the region. UMA PEMMARAJU: Now you know Fleet Week this week is underway and it's such a grand event and people look forward to it. Talk to us about what’s coming up during this Fleet Week. ADM. HARRY HARRIS: Fleet Week is obviously an important way for our Navy to share with the people who fund it, who pay for it, the American people. It’s a way to get back to our roots if you will. New York is a great city and to have Fleet Week here and other Fleet Weeks throughout the nation is important for us and for the country we serve. UMA PEMMARAJU: On a personal note what’s it been like for you to be the Admiral of this great organization? ADM. HARRY HARRIS: Well, I’m deeply honored by the trust and confidence that the nation has in me to be the Pacific Fleet commander. It’s a life’s dream, if you will. It’s a dream job for a naval officer and I’m grateful for that opportunity. I’m here in New York to accept an award on behalf of the Navy. I’m here for the National Ethic Coalition of Organizations’ Ellis Island Medal of Honor award, and I’m honored to be a recipient of that for this year. UMA PEMMARAJU: Well congratulations, sir. It’s great to have you here. We’re honored to have you. ADM. HARRY HARRIS: Ms. Pemmaraju, thank you very much, I’m honored to be here. UMA PEMMARAJU: Thank you sir, all the best.